I think it’s wonderful to catch-up with people with whom you share a passion for artisan culinary craftwork and the exchange of food/life experiences but don’t often get a chance to meet with. I spent some happy minutes visiting Mona and Christer Fredriksson foodstall at Passion för Mat 2018. 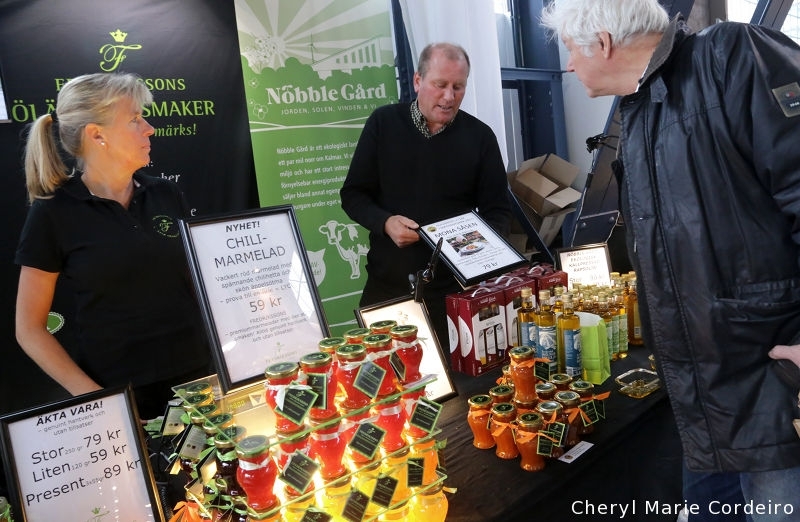 Fredrikssons Smakglädje began in 2012 in southern Sweden (near Kalmar), with a focus on handcrafted, quality marmalades. Their key marmalade philosophy is to focus on the type of taste experience they wanted people to have when eating their marmalades. They also wanted to craft new marmalade flavours, choosing their ingredients carefully for each batch created. The intense flavours and luxurious textures of their marmalades are reflected likewise in the jeweltoned bottles lit on the display stand. Fredrikssons’s efforts on craftsmanship have not gone unnoticed in the Swedish culinary circles. Their products have since 2014, consistently won awards in the grand Swedish artisan culinary mastership (SM i mathantverk). Of notable mention is their 2017 Mona sauce, chosen for its excellent summer feel to a perfect grill sauce. Fredriksson’s Juleglögg (Swedish Christmas mulled wine) won silver medal in the 2015 SM i mathantverk and they took home both gold and silver medals in SM i mathantverk 2014 for their Hot Apple and Apricot Chutney, and Honeypear and Ginger Marmelade. The bit of news that made me happy was that Fredrikssons has a webshop and now deliver to your doorstep.